I wanted to thank you all SO much for this fabulous week on Big Horn Mountain. It’s been one of the most memorable (I think actually ‘the’ most memorable) experience in my life. From the first minute to the last one (which came way too fast! ), I have been filled by the warmth, generosity, authenticity and beauty of the nature, people, horses and lifestyle that surrounded me. I am very grateful and I feel privileged to have had the chance to be part of your ‘big family’ for a week and discover what a real cattle drive looks/feels like. I am now back in DC, energized and grounded thanks to all the good things I have seen and learned with you. I also would like to tell you how much I loved riding Forrest. I have been humbled by his strength, agility, generosity and sensitivity. I trusted him so much and I could feel a shared joy when we were driving the cattle together. This was a great match. This little guy has been a fabulous partner. This was the trip of a lifetime. The scenery was stunning, the horses were spectacular, the cattle work was challenging and exciting, but what made it really special was the people. They were the most gracious and patient hosts full of stories and jokes. Everyone was made to feel welcome and valued. This was a special place on the planet and one of the best experiences in my life. I’d do it again in a heartbeat. I rode Tigerlily, and she was perfect for me. All the horses were very well matched to their riders. The operators did a good job of swapping horses out when they looked at bit sore from the long and heavy ride the day before. The quality of the riders was very good on this ride. The Double Rafter Cattle Drive takes you on horseback through the beautiful wilderness of the Bighorn Mountains. The horses are hard-working and well cared for. The staff have been herding cattle for generations so they are full of information about the business and the area. They show pride in their work and are happy to share it with others. This is a true cowboy experience! This is definitely cowboy life! The staff take you on a daily journey through the wilderness of Big Horn Mountain, where you are able to see nature at its best. The horses are well trained, well cared for, and are able to conquer the mountain so you can enjoy natures scenery. We even got an opportunity to heard some cattle through the bushes which was one of many highlights of this trip! Book it and have an awesome time!!!!! Amazing experience! Never thought I’d find myself riding horses out in Wyoming but I’m very glad I did. Staff is incredible, scenery is breath-taking, and the riding was like none-other. Thanks for the adventure! Great Cowboy adventure! You go up 10000+ft into the Mountains and get to choose your pace, whether you want to push yourself or take your time is completely up to you. The staff is accommodating and very knowledgeable. Scenery is something you only see on post cards. The food is delicious! Horses are very well trained with an assortment of personalities. Highly recommended if you want an amazing authentic Cowboy experience. You want a real cowboy adventure herding cattle on the top of Big Horn mountain at 11,000 feet. You will live the life of cowboys as it was century ago. An adventure not to miss. The horseback riding is very exciting with creeks crossing, mud slide, rocky canyon trails, and much more. The food is good cowboy american recipes such steaks, smoked ham, ribs, dutch oven peach cobblers, pancakes, sausages, and much more. As many of your guest my expectations were very high, as I didn’t want to end up in a dude Ranch, and you can’t have all your answers on the web. What I went through during these 5 days is just crazy, even in my wildest dreams I couldn’t have lived this. Panorama, food, guests, cooks, cowboys, knee pain, work, everything was top of the cream, but above all I have a thought for Traveler, this incredible painted QH, that was climbing like a squirrel, going downhill like Lindsey Vonn, had cow sense and such a huge hart, what an extraordinary partner. As I am a little of a lonesome cowboy, I really enjoyed the freedom you gave us to go anywhere alone or with a couple of other riders, and help doing the Job. Even before I watch the video you posted on your new web site, I had decided to come back for a new ride in 2017. Every day that goes by I remember this drive ( in god’s country) that brings back a smile on my face. Thanks for the ride. I wish you all a merry Xmas and a happy new Year. Because I don’t compose well I am going to use just words to describe my trip with you, Alice, Trent and Taylor plus the whole gang. Rough, dirty, dusty, hard riding, hours a day in the saddle, no showers, slept in tents on a tarp on a cot with pad and sleeping bag, no electricity, not for everyone, beautiful, great folks (both guests and owners), unbelievable food done entirely in cast iron and on a grill, water from a stream that was so cold and great and made the best coffee – in total, an awesome and spectacular trip !!!!!!! We loved it ! Experiences as vivid as the open cattle drive leave an indelible imprint on one’s soul. Rarely can one experience a sensory overload in the absolute silence of nature. The mountains, the trees, the streams, the wildflowers, the smell of sweet grass and pine, the sight of elk and deer, rugged terrain breaking into deep meadows. . .the peace punctuated by cattle, bawling for their calves. It was amazing, and I am still riding through it all in my mind. I appreciated the logistics, expertise, friendliness, insights and unique opportunity to to be part of your extended family. To each one, thank you for the adventure of a lifetime. My expectations on this trip was really high. This trip exceeded my expectations more than I could ever imagine!! I had great horses, amazing food, a view from heaven, the best service I could get and thankful for the really good cowboys and nice wranglers who helped us with the cattle and made this to the journey of my life! Thank you for just being you. From the get-go, I knew I was a part of something special. Grandparents, parents, children, grandchildren, the family dogs, the close-knit crew, the twenty-four excited guests, the magnificent horses, the goat, the bulls, and yes…even the bawling calves, anxious mother cows, and ornery yearlings….all intertwined to create a “never-will-forget” experience. One word sums up my personal experience…FREEDOM. Free to do as much or as little as I wanted. Free to ride at a pace I was comfortable with (horse race anyone?). Free to ride to the river to take a dip if I wanted. Free to choose which group, and what chore, I wanted to do for the day. I must admit, I was a little apprehensive as to the little amount of instruction given, but then, that in itself, was freedom. The wrangler’s didn’t hover, but they had our backs. They never appeared in a hurry (which they must have been sometimes, behind the scene) which created a laid-back, no pressure atmosphere. It was very apparent, this drive wasn’t about them and what they needed to achieve that week. It was about us and allowing us to create our own experiences. The only way, Cowboss, that you could make this trip any better, is to make it longer! Two weeks should just about do it. Thanks for allowing me the freedom to create my own experiences. It will be hard to top this trip, for sure. I wanted to write and thank you one more time for the outstanding cattle drive adventure. That was the best vacation I have ever taken in my 61 years of living. Believe me, I have traveled a lot and had many adventures but none as pleasing as the cattle drive. From the viewpoint of a guest, the complicated logistics were transparent, the food was truly gourmet, and I slept better (even sleeping on a rock) than I have in several years. At no time, did I feel any anxiety even though I was tackling the most difficult trail riding I have ever done. Kudos go to the crew, the horses, the cattle, and even the bully bull. I very much enjoyed the conversation that I seemed to monopolize with Alice on the ride to the Billings airport. I don’t know if I will be able to get west again but it is because of my responsibilities at home. However, I will send as many folks your way as I can. The Kerns family, along with Chris and Crickett ,Murphy, John ,Stan, and others are the most patient, kind and talented cowboys in the west. The safety for their Guests is paramount. The Kerns’ and Staff treat you like family. Chris Ellsworth(Horse Whisperer),ensures the horses respond to the riders needs. Ken and the most charming Matriarch, Mrs. Ken Kerns, Dana and Alice, Trent and Alicia, Crickett and Murphy, Chris, Stan, John and their kindness keep you coming back. Also, the other guests from all over the planet. They are so friendly and helpful. Double Rafter doesn’t deserve the Top 50…..IT DESERVES THE TOP ONE !!!!!!!!! Terrific opportunity to work as family members on a working ranch. I have run hospitality businesses before and rate this family as tops in how they take care of people and make them feel as if they are truly family It is real, no dude, no nose to tail, it is hard work, it is authentic. I have worked on ranches before and own horses. This is not a city slicker operation. The horses are as good as it gets! The majority of people we rode with have been there multiple times. If you want to know how cowboys make a living, go on this ride. But, when things get too tough for you, they are gracious and accommodating if you want to hang out at camp. For the rest of us, we ride 8 to 12 hours a day, eat out of our saddlebag, and experience the real, not make believe, work of a ranch hand. The Double Rafter is very representative of the western way of life and also for maintaining the traditions of the cowboy and cattle with the environment, linking both worlds. Once you meet the 3 generations of Kerns and get a glance of their way of life and traditions, you will not want to go back to your actual way of life. The first thing for me is that we are working with the family in a family business, is such that we are treated the same way as family and crew at the same time and without forgetting that we are also guess. This is for me an obvious reason to go back. Whatever the country or state that you come from, you are not treated differently, you will feel part of the family or crew. If you really want to know the feeling of working on a ranch is, how life on a ranch and for a rancher look like and goes thru, this is not close to the reality what this rancher goes thru, it is reality thru the rides and stories around the camp fire, this is the place to go. The people are real, the location is just breath taking and you will come back with the most amazing real life adventure of your life. This is not a Dude Ranch, the work is for real, the saddle time is for real and more imprtantly, the people are real….. I have 3 horses and I have been riding for the last 6 years, the last 4 years I have attended a trip at the Double Rafter, every time I have left that ranch I have look at the time it will take me to be back, for the people, the view, the life style I am going thru in a week…. Just an amazing time around people, horse, cattle, nature and the environment surrounding all of this. An experience you will never forget and cherish for life. You must do it at least once, but you will keep on coming back! No other ranch offers real cowboy adventure. You really feel like a cowboy in the old time chasing cattle up and down Big Horn at 11,000 feet elevation. It is the real deal for real cowboys! No other place like it. Very unique. Dana has a wonderful sense of humor, and enjoys getting to know his guests. He has a nightly white saddlebag award that encourages friendship and fun. You are paired with a horse for the week and you ride out each day to do the work of a cowboy with the cowboys. You travel with the cows from the top of the mountain to the bottom. You are camping out along the way. You are a cowboy. Chris is an expert horseman. He gives horsemanship clinics and will tutor you along the trail as well. Your horsemanship skills can improve greatly if you want to work on them. Only cattle drive I know of where the guests camp out in the mountains and the great outdoors. No gourmet meals or hotel rooms, a very authentic cowboy experience. Authentic outdoor living as the cowboys did it. 6 days of camping and living in the beautiful mountains. No cell phone or internet, perfect place to disconnect and enjoy the great outdoors. Ranch owned and operated by family members and are full of great humor, a wealth of information not only about cattle ranching, but the rich history of the west, land preservation, the major industry and settlement of Wyoming and authentically interested in all of their guests. This is an adventure, and brings with it all the unknown and unexpected challenges that a good adventure should. It is fluid, dynamic, flexible and ever changing like the landscape, and at the end of the day, when you literally crawl into your tent, you can sleep well knowing you have put in a hard days work, doing something important….perhaps not what you set out to do that day, but hey, isn’t that what life is? This is not a ‘riding program’, it is a cattle drive, and all the challenges that come with job, it’s the real deal. For all the dirt, sweat, aching muscles, lack of sleep, heat and hours in saddle you’d wonder why anyone would come back? The answer is simple, the people. The Kerns have a way of turning their way of life into a way of life we all admire and respect. The laughter, the outstanding dutch oven food, the stories, the friendships, the beautiful landscapes, the peaceful starlight nights, the campfires, the cows…the Kerns. It gives you a sense of pride to be able to participate in maintaining a way of life that is slowly vanishing with a family that makes us all want to be better people. Everyone seeks out adventure trips for different reasons, and ranchers show up to the Double Rafters every year with different expectations for their trip….but no matter where they come from, how far they’ve traveled, whether they’re there because it’s on their bucket-list, as a graduation gift, as a dream realized, or a curiosity, everyone leaves forever changed. And like me, many come back over and over again. Double Rafter is family owned and operated, as a guest, you are treated as family. (Except you don’t have to do the dishes!) The staff will evaluate your experience and if for some reason you and your mount are not suited to each other, they will switch you to a new mount. These aren’t nose to tail horses, they are extremely well trained, know their job and have personalities. This as close to the real thing as you will ever get. The family, the riding, the cattle, the lodgings, the beautiful mountains, the food and the weather… there is nothing to keep you from returning again, and again and again! Double Rafter cattle drives are the real thing, you respond to the situation at hand. Every day, every trip is a new adventure! The Kerns family-they are personable, enjoy meeting new and greeting old guests. It is helpful to have had a couple lessons if you have never ridden a horse before but knowing how to ride is not a requirement. There is a horsemanship lesson at the beginning of each trip where the basics of saddling and riding are gone over. Family Run operation, that’s concerned with the overall guest experience. Great to have 3 generations of ranchers/family on the same drive!! Not a nose to tale ride. Great country. Often times myself and fellow guests would be spread over several miles looking for cattle. They made you feel like you were part of the ranch experience. It was the real thing, it was something I wanted to do since I was a small kid watching a western movie, and wishing that I was there. the reality of it all, The host and his crew are professionals and you are treated very very well. This is a outstanding experience for anyone who wants to dream that he is a real cowboy. Treated everyone like they were old friends and welcomed them into their family for the duration of the trip. We were perfectly matched to our horses based on past riding experience. The way the trip unfolds everyone has time to get to know their horse, care for their horse and develop a relationship with the horse. The importance of this becomes apparent on the last legs of your journey and the difficultly of the trails leading the cattle out of the mountains. We were properly prepared during the early days of horse camp to daily riding around looking for cattle. This helped build confidence in oneself and the horse we had been matched with. For people that want a luxury vacation this is not it. You are a cow hand for the week, no glitz, no glamour. Be prepared to be dirty, laugh a lot – if you have a sense of humor, if not you will get one. Like Dana says ” you never know what might happen” you have to go with the flow. It’s rates as one of the best vacations I have ever had! I was truly amazed at the magnitude of respect and the apparent partnership between the ranchers and the land. What they do is so much more than just letting cattle graze, moving them from time to time. There is a mutual respect between the ranchers, cattle, horses, land and mother nature. The Kerns family shares this with their guests. The horse clinic on the first day was very informative. I have been riding horse for well over 35 years and I was able to learn a few things at the clinic that I have incorporated into my riding routine here at home. The Kerns family makes every effort to match each rider with a compatible horse. In my case Dana switched me onto a different horse the second day of the trip. Although I liked the horse that I rode the first day and didn’t have any problems with him, I loved the horse that I started riding the second day. He was full of personality and was a blast to ride. Dana thoughtfully pairs each rider with a horse to match their skill level and personality and in my case he really hit the mark. I would have to say…the authentic experience , the thoughtful, gracious hosts and the amazing food. For me this was to be “a trip of a lifetime” and it truly was. However, after spending a week with the Kerns family and their staff I would love to do it again. They have an amazing respect for the land, cattle and the horses. The entire staff was gracious and thoughtful. They worked tirelessly to provide the very best experience for each of us, allowing the guests to do as much or as little as we wanted to each day. I feel fortunate to have had the opportunity to be a part of the Double Rafter Ranch and look forward to riding with them again. This is the real deal and I loved it! I wanted a real cattle drive experience, not posh accommodations and moving cattle down a lane between pastures. The mountain country that the ranch is a part of has breathtaking beauty which creates many challenges for moving cattle. The Kerns family made sure we had everything we needed and kept us well fed and safe. For a week we lived as they do, camped out under the stars, long days on horseback working with cattle and meals cooked in cast iron dutch ovens. At times it was frustrating moving the cattle but there was plenty of enjoyment along the way and the Kerns family shared in all of that with the guests. They were grateful we chose to spend time with them and I was grateful that it was them that I chose. This is truly a family operation. You will never work so hard nor laugh so much, all while learning a piece of American history and culture as well as current day ups and downs of cattle ranching. I was in awe of the care they took of all their animals, horses and cows. Chelsea and I are back in the swing of things. I took 280 pictures, everyone is amazed at the country and all that we did! Branding ME !!! Who woulda thought!? Anyway, I really don’t have the words to tell you all what a wonderful time we had. It was a trip that can compare to no other. My Mom had passed away after a very long battle with Dementia on July 26th. Needless to say I may have skipped it, if not for Chelsea also going. I just felt guilty about going away just after she died, it was hard because my Dad had passed away a few months before very suddenly. Luckily my entire family said it would be good for me. I went away and planned on thinking of nothing except the place and people I was vacationing with. It worked!! I took in every moment, and thought of nothing else. Watching Chelsea enjoy herself so much was a Moms dream, she’s a natural on a horse! Me on the other hand, I think held my own, would have liked a portapotty attached to the saddle, and a cup of coffee delivered to my TP though! You couldn’t have asked for a nicer group of people, and that food was fantastic. If not for Trent, we may have froze in our tents, tell him thanks again. Taylor was just a joy to ride with, I know you are very proud of your boys, they are wonderful young men. Alice, after seeing the woods, (sorry, timbers as you cowboys call them) there is no way my yoga paints would have held up. Wearing the same paints and not taking a shower for so long is something I never thought I could do, but as long as we all did – what the heck. Some friends back her in NJ still think I’m nuts and couldn’t imagine such a trip, but they don’t know what they are missing. Thank you so very much! We would just like to thank you for the most wonderful trip ever on the Sept 11 cattle drive. The whole operation was outstanding, the organising & logistics for you, your family and the team to carry out was phenomenal. The food was unbelievable what those camp ovens turn out is exceptional. We could not have asked for a better group of people to spend our vacation with, we had so much fun. Your horses are amazing and a credit to you and your team. Please feel free to use us as a reference for any Australians interested in your cattle drives. Dear Dana, Alice and all the wonderful people we met in Wyoming. First off all thank you for the most wonderful week in the mountains. It really was the trip of a lifetime. I will never forget the great nature and all the times we just said: “Wow” because there was a new fantastic view around the next corner: mountaintops- trees- water- animals or simply the very, very, blue sky. And the special feeling in the early morning standing around the fire with the hot coffee, watching the sunrise, with the horses grazing around the tents,—I will never forget that. I hope you got all the cattle back home before the snow came in—also the “very few” we missed on the way up. I am sure that after 3-4 years in Wyoming , we will be a little smarter, but not nearly as smart as the cattle, they knew how to make fun of us. Thank You for the DVD it was great to se it all again, and dream back to the great nature and the great people. If You meet “Jackson” out in the mountains, then thank him for having been such a great companion and been so patient with me, when I tried to make him take one way down the cliff, and he knew, that the other way was much better—and he off course was the smartest; he really was a good friend, and I hope, that he and the other horses enjoy their freedom in the mountains until next season. All the best wishes for a merry x-mas and a happy new year to all -with 2 or 4 legs-, that we met in Bighorn Mountains. I have had the good fortune of riding horses along the shores of many foreign lands, riding camels in the blowing sands of the Sahara Dessert in search of an elusive oasis, and riding atop elephants in the steamy jungles of Nepal for an encounter with White Rhinos. However, these unique adventures do not compare to the Double Rafter Cattle Drive (DRCD). Although Wyoming is not an exotic foreign destination, the DRCD has been my most exciting, challenging, ‘foreign’, and worthwhile life changing experience. Friends ask why would you pay someone for the opportunity to work FOR them? The answers are simple … the DRCD gives you a glimpse into the history of our country, an understanding of the rancher’s life, and an incomparable connection with cattle, horses, and the environment. 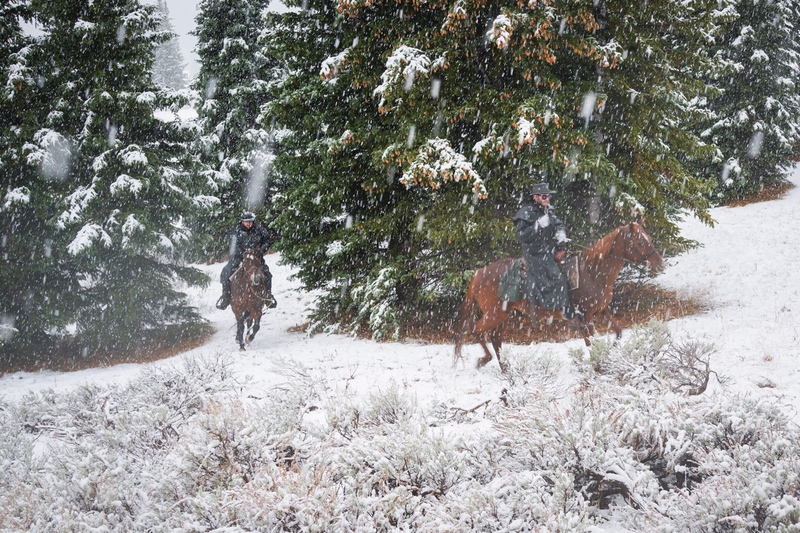 The rider’s classroom is on horseback, surrounded in a sea of cattle, in the midst of spectacular wilderness, with a new adventure awaiting you at every moment. Each day, each hour, is different from the previous one. The unexpected becomes the expected. You have a job to do. You try to do the best that you can, regardless of your riding experience or ability. Why would you want to ride/work for 8 plus hours per day in steep terrain, thick woods, and through rushing streams? Because of the beauty, excitement, and opportunity to prove only to yourself that you can. The talented wranglers assist you when needed, but do not coddle you. You are on the cattle drive to work. The other guests share their excitement along the trail, and at night around the camp fire. The cook staff provide the best cuisine imaginable after a long day in the saddle. With flames blazing in the crisp clean night air, stories are shared, and tales are exaggerated. How fortunate are we all for having had such a most excellent memorable day? Thank you for providing one of the most memorable experiences of my life. I am amazed at the number of lives your family touches through these trips. it is unfortunate that you can’t see the ripples that you have made in the water! Your cattle drives are so much more than moving cattle from one place to another-they move people from one place to another. In a weeks time people are moved to places of appreciation and inspiration, places of understanding and reflection and of empathy and connection. We all left with a great respect for the lives that you lead, the lands you protect and the way of life you have preserved for all of us! 10. You do not have to remember to lock your room door. 9. There is no need to set the room thermostat. 8. You do not have to worry that the water boiler will break down. 7. People cannot bother you with work by email or cell phone. 6. There is free 24/7 emergency medical care just minutes away, and no insurance card needed. 5. There is no extra charge for unlimited beer. 4. You never have to flush. 3. You have no need to request “wake-up calls; they are provided automatically. 2. You have a daily chance to win the use of special white saddlebags. 1. You never have to wonder what you will have for lunch. Matt Riker, here. One half of the Riker’s, from this past clean up ride. I can’t tell you how the drive affected my life, for the positive. I have to thank you and Trent, as well as the rest of the Kerns Family for showing us a hospitable and familial time out there in the wild country. My Father and I had never experienced a quest like that before. I was very proud of my Dad, for being a novice and at 67 yrs old, being the oldest, getting through that trip, relatively unscathed! I never stop looking at our pictures, and won’t ever forget our time with you. I have been to many horsemanship clinics and Chris Ellsworth is as good as any of them and better than most of them! Be prepared to have the best week of your life! The entire trip is a high. I could write a book about it. Be prepared to have a lot of fun and the time of your life. I was very impressed with how well organized the trip was and accommodating the crew was. I look on this as one of the best things I have ever done. Your crew was great, they all had the right can do positive attitude even whilst they are working and we were resting. I had a great time on this trip, it was money well spent. The food was superb!!! The horses were better than our own-They were wonderful-ours would have freaked out. The trip was perfect for our honeymoon! The trip as a whole was very well organized and professionally run. I felt like the trip was a bargain for what I got out of it. The horsemanship clinic was excellent. First cattle drive I went on in Montana they gave you your horse, yelled at you for an hour and off they went. The whole trip exceeded my expectations. Be prepared to get up early, bring your appetite. It’s a real experience-not like you see on TV. Never has an experience so profoundly affected me. I know I left part of me behind, somewhere between the chill of the rushing river or the warmth of a campfire story. The reward of every challenge was so gratifying. The high point was the setting, the highly skilled staff, and the ability to make a mistake and improve with help. It is incredible what you provide for the cost. The statements on your website are absolutely true and I will be recommending this trip to everyone I know! At the horsemanship clinic I learned I was doing a lot of things wrong at home. It is more than you can imagine it to be! If you ever want an experience of a lifetime, a Double Rafter Cattle Drive is a must. As my family often says, “We ride for the brand and we love the chance to Mother Up,” that’s cowboy talk….just go on the trip and you will learn all about it. Your website is really good, but no comparison to the real thing. It is truly a vacation of a lifetime, just as promised. Another amazing trip. Wild weather – great people – and the best crew ever. Just read the Sept 2002 trip report. It was great to re-live the best “vacation” I ever took.